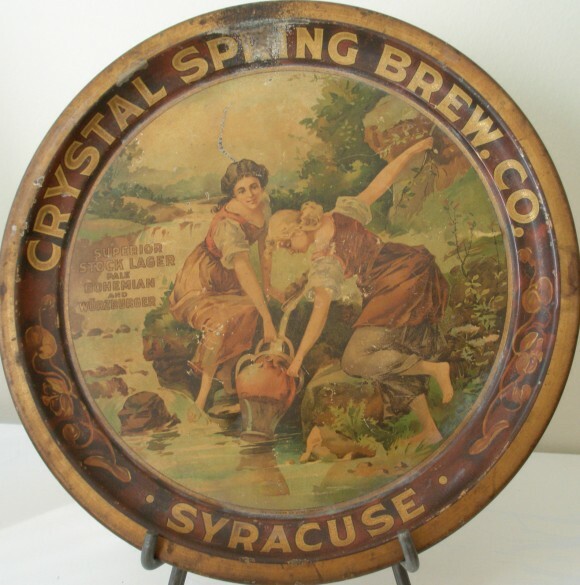 This tray for the Crystal Springs Brewing Company of Syracuse, New York advertises their Superior Stock Lager, Pale Bohemian, and Wurzburger beers. This 12″ round tray dates to around 1900 and was manufactured by the Chas. Shonk Lithography Company. The main field of the tray is a beautiful and detailed image of two women collecting water from a bucolic stream setting. There is also great depth to the lettering on the rim as well as the decorative motifs on the border. This is a great tray that collectors often get excited about when it is great condition.